Hotel And Leisure Living Services Ltd., under the Hotel Fun 4 Kids™ Program is committed to helping Hotels and Resorts implement, enhance and improve services and fun for children. We offer many different types of products designed and selected to inspire creative and artistic play for children. Our colouring and craft products can be utilized as Welcome Products for children on check in at Hotels, entertainment in restaurants or as supplies for supervised children's activities year round, seasonally or for special events. In continuing our commitment to safety for children while travelling, we recommend that these products be used for children over the age of 3. We monitor recall notices for products we sell. See Crayon Safety below for more information. 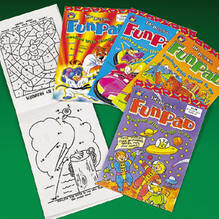 CHOOSE FROM - Regular Size Themed Coloring Books, Preschool Generic Coloring Book, Activity Pads and Small Activity Book. Bulk and small package pencil crayons. Bulk and small package chalkboard and sidewalk chalk. The Consumer Product Safety Commission in the United States continues to monitor children's crayons to make sure they are safe. Recall notices have been issued for crayons that contain lead and pose a threat of lead poisoning for children. "Lead has long been recognized as a hazardous substance, especially to young children, infants, and fetuses. Lead poisoning can cause irreversible brain damage and can impair mental functioning. It can retard mental and physical development and reduce attention span." Concerns have also been raised about crayons that contain small amounts of asbestos, talc and "transitional" fiber, which is similar in appearance to asbestos fiber. Major crayon manufacturers have been asked to reformulate crayons to remove these ingredients from crayons. A number of crayon products produced in China have been recalled by the CPSC as a result of high levels of lead, with "enough lead to present a lead poisoning hazard to young children who might eat or chew on the crayons". A warning issued by the CPSC advised to "Buy only crayons and other children's art materials that have this label: "Conforms to ASTM D-4236" (or similar words) which means that a toxicologist has reviewed the formula of the art material for chronic hazards". However, the CPSC has also found that some products containing this label did in fact contain levels of lead and has pledged to continue monitoring these products as well as working with U.S. Customs to seize non-ASTM-labeled crayons. If you have any concerns with respect to crayons, please do not hesitate to contact us. The Hotel Fun 4 Kids™ Program provides on going information services with respect to the safety of products for children.